There’s no surprise to see that the body of the RG5121 takes the traditional RG shape, with comfortable contours, sleek edges and a generous double cutaway to allow endless playability in the higher registers. For an RG – a series steeped in aggressive metal attitude – the RG5121 shows off a grownup design, with a sophisticated satin-finished Dark Tide Blue paintjob on the top. The unpainted back and sides of the guitar show off the beautiful grain of the solid African mahogany in all its glory, separated by a strip of white binding along the side. Aside from the cool luminescent Ibanez logo on the headstock, this is a subtle but incredibly stylish axe. The neck takes a slightly different direction, made of alternating maple and wenge. Bolted onto the body, this sturdy five-piece neck features Ibanez’s slim Super Wizard HD profile and a satin finish, which is like butter to play – melted butter at that! This is topped by a sleek Macassar ebony fretboard with 24 jumbo stainless-steel frets for enhanced playability, along with offset mother-of-pearl dot inlays and handy Luminlay side dots. As you would expect from a high-end Ibanez, the craftsmanship is exceptional. The build, finish and setup are flawless, and a testament to the luthiers at the brand’s respected Japanese facility. Top marks. It’s not just a pretty face – this RG5121 is built for the stage and the hardware confirms this. It’s loaded with a pair of Fishman Fluence modern active ceramic humbuckers at the bridge and neck. Fishman is a renowned name in the acoustic guitar electronics market, yet they are taken seriously in the electric guitar market too due to quality pickups such as these. As for controls, the RG5121 features a three-way pickup selector switch, along with master volume and master tone control knob, along with one mini switch in between. This works in conjunction with the push/pull function on the volume control knob to allow you to change the voicing of the guitar. The headstock is fitted with a set of Gotoh MG-T locking machine heads and a black TUSQ XL nut, while the bridge is a Gibraltar Standard II, which is hardtail heaven. So, even though you won’t be nailing any divebombs, your tuning stability is rock solid, while sustain is near infinite. Note, the RG5121 comes with its own hardshell case – not unexpected at this price, but we’d complain if it wasn’t there! Tonally, the RG5121 has a lot going for it and is no one-trick pony. Sure, it has metal in its heart and delivers powerful, aggressive tones on demand – tone that will slice through any loud metal mix. Whether you are chugging away in a heavy tuning or tapping a solo, everything comes across crisp and tight. However, the ability to change voice adds a level of versatility not seen on many active pickup-equipped guitars. This allows you to switch from a slightly more clinical active tone to a more relaxed sound that works better for styles where thicker, warmer tones are required. Spend ten minutes with the RG5121 and you’ll understand why it’s the pick of Ibanez’s 2019 range. The tasteful and high-end appearance, combined with the lightning-fast neck, makes it a real pleasure to pick up and play. Such a powerful, yet versatile sound from a set of active humbuckers is a real pleasure too. It’s not a cheap guitar, but this is built for serious musicians wanting the best from their main axe. 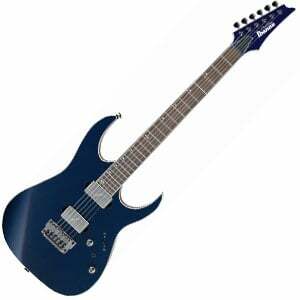 For more info about the Ibanez RG5121, click here. For more Electric Guitar Under $2000 you might like, click here.